I HEART Dosa.. Like really really HEART Dosa! Infact it was one of the first things,I learned to make perfectly.I was in grade 9-10 and we had a maid called Anthony Amma.She was a mother of 8 and super-smart,eager to learn. My mom had trouble rolling rotis and so one of Anthony Amma’s jobs was to make rotis too. Now,the Babushka and SD love Dosas too and we can have it ALL day long! Seriously,I am not kidding..I make a huge pot of Sambhar and a big bowl of chutney in the morning on weekends..and we have Dosa-chutney-Sambhar for brekky,lunch and dinner! Why am I writing all this?Well no reason,just that we had Dosa-Sambhar-chutney for Dinner and its still on my mind..:) And every time I make Dosa,I remember how someone had once served me no-oil Dosa,I ate one politely..and then,caved in said, “I am sorry..but could you make me one dosa will a little oil or ghee? ” LOL!! if looks could kill that would have been my last dosa..
What about you?How do you like your Dosa? 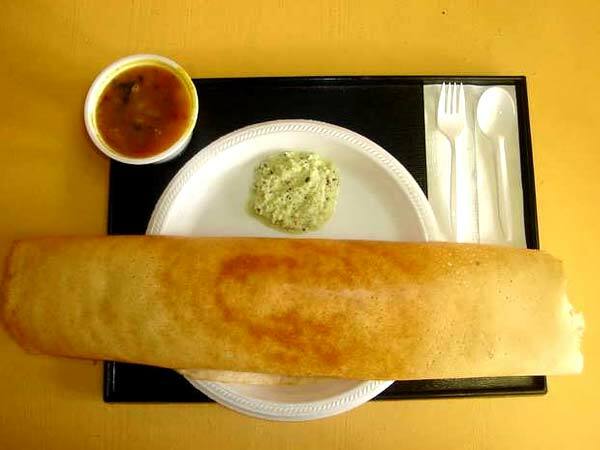 or if you don’t like Dosa,what’s your favorite food?? Absolutely!! B’lore is on my list for a long time now.. meeting you and the yumm dosas are just the right push,I need. Yes! The keyboard is about to drown in my drool!! Thank God,you stay in Mumbai! !Visiting you,is surely Do-able!without any extra planning! At home too, its very convenient to have the batter in fridge and have it for breakfasts..
Hey you are in Hyderabad,right? Do you like Chutneys?? :D.. yea, Chutneys was quite close to our college u knw.. we frnds used to escape thr sometimes for the piping hot dosas n idlis..
and i am drooling again..n its 1 am! ooooooooooooh yum yum yum… for all threee.. all of those are my fav. too!!! !